Fill the imprint with color, pattern of your choice. You can add digital papers that is saved on your computer in your computer file, or use the color button to use color pallet, or use the add paper button to use paper that you have in my memories suite. Open the imprints to import imprints from your computer click the green file that says Custom this will import your imprint from your computer file. NOTE if you want to use the imprints already in my memories or if you purchased imprint then you can simply click the Blue Butterfly that says ADD. Next either fill the imprint with color or fill with Digital Paper or import Digital paper from your computer in the color or pattern you like. Do this with several flower parts and layer each one to create your flowers. Remember to have Fun and to export and save your pretty flower as a png file so that it has a transparent background. 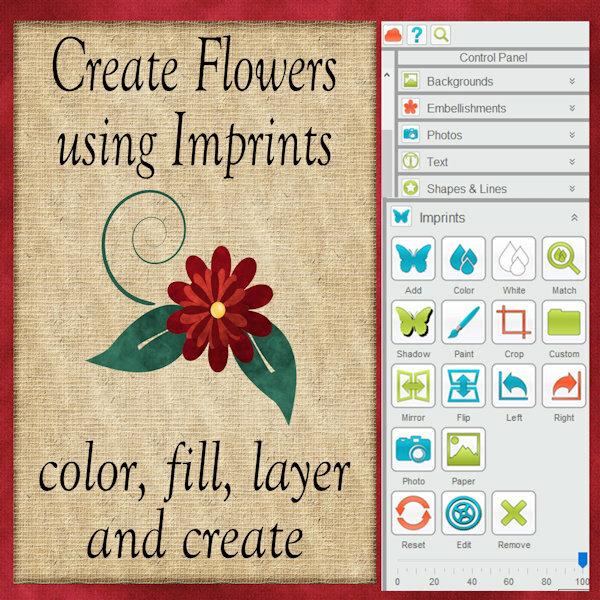 Save your flower and use it in your scrapbooking projects. Have fun creating your flowers and Thank You for joining Paylor Studio's with this Designer Tip.